On February 2nd 2006 I was aboard the Enterprise, no not the starship, but an express train to Belfast to report on a Seminar and question and answering session, presented by Positive Lives and Concern, which took place at the University of Ulster. 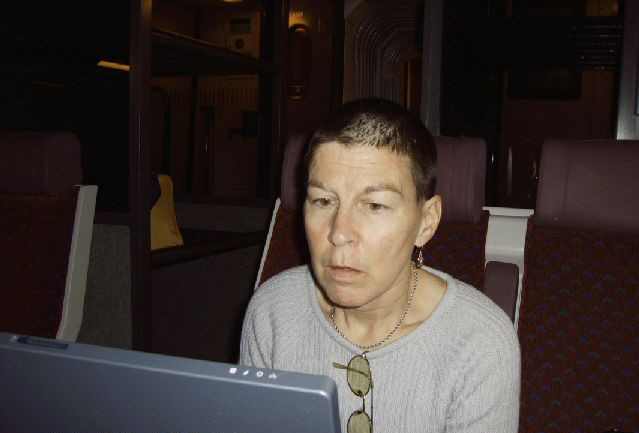 I travelled to Belfast together with Concerns global HIV/Aids advisor Breeda Gahan who is a very charming travel companion and a woman who knows what she is taking about, as she is working with Concern for 18 years. Apart from Breeda Gahan there were some other people on the panel: Norther Ireland Human Rights Chief Commisioner Monica McWilliams, Kevin Ryan, the director of Positive Lives and a very fine gentlemen indeed, Noelle Houston, who talked about a local perspective on Human Rights and AIDS, and Boni Rutijanuv from Concern in Rwanda. The event was chaired by a colleague of mine Wendy Austin who works as a presenter for the BBC in Northern Ireland and who did a great job. The University of Ulster is also hosting a Positive Lives Photo Exhibition titled POSITIVE LIVES, an exhibiton to change attitudes. Needless to say that I had a look around myself and I asked people about their first impressions.This exhibition is dedicated to those who are living with HIV and AIDS. To those who have lost their lives to the disease and to those who love them.